If you’re about to order the final couple seasons of “CHiPs” on DVD, you may want to hold off for a few months. 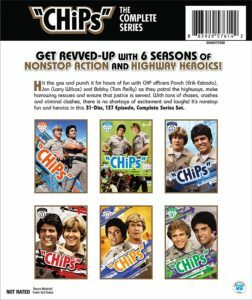 Warner Bros. has announced a DVD box set of the complete series of “CHiPs” to be released on June 6, 2017, the same day as the DVDs for season 6. 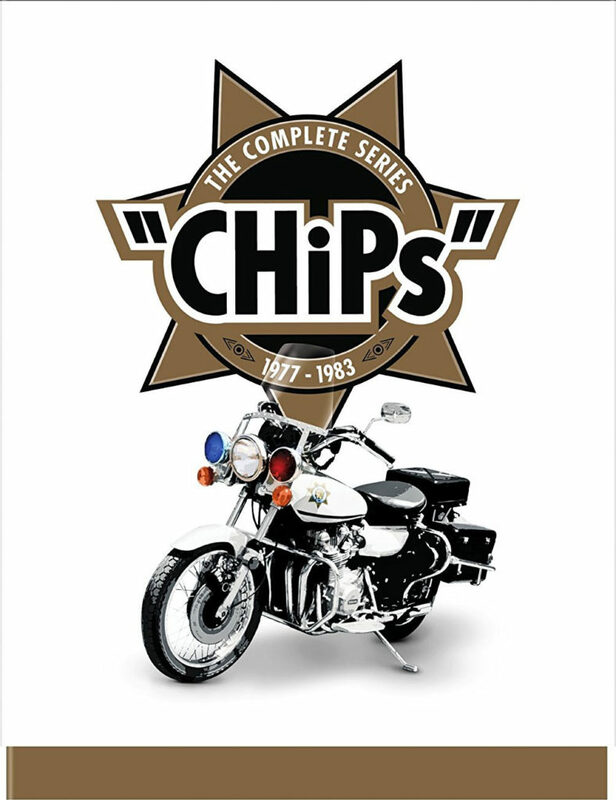 The front of the box has a classic CHP Kawasaki motorcycle and a stylized CHP badge that says “CHiPs” The Complete Series 1977 – 1983. Get revved-up with 6 seasons of nonstop action and highway heroics! Hit the gas and punch it for hours of fun with CHP officers Ponch (Erik Estrada), Jon (Larry Wilcox) and Bobby (Tom Reilly) as they patrol the highways, make harrowing rescues and ensure that justice is served. With tons of chases, crashes and criminal clashes, there is no shortage of excitement and laughs! It’s nonstop fun and heroics in this 31-Disc, 137 Episode, Complete Series Set. The 31-disc set will set you back $129.99 and can be pre-ordered today from Amazon.com. It does not include the CHiPs ’99 TV movie, but that can be purchased on DVD separately.